Someone let me know today that they were having trouble with their Majesty Palm so I thought I'd write out the correct care for it here. 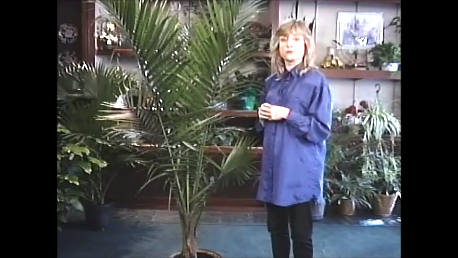 I did a short segment on this palm in one of the episodes of the TV series, "The Indoor Garden" in the 90's. This is a tall and lovely palm that can bring some peacefulness to your home. It's not as wide as most of the other palms with large fronds and you may find you have just right the place for it even in a smaller room or a narrow space..There is something about palms that is so soothing. With just the right care the Majesty palm can grace a space for years. Palms can be dust collectors so it would be wise to own a feather duster to gently use on it once in awhile. A gentle shower with a garden hose or in the shower, from time to time, would be helpful too. Bright indirect light or some direct sun. Full afternoon sun is too much. I've only seen these sold in a 10" (25 cm) diameter sized pot. In that size, it should be watered when it is quite dry on the soil surface, however long that takes. Water with up to 2 quarts ( 2 liters) of water when necessary. (in a 10" or 25cm container.) Up to 1 gallon (almost 4 liters) in a 14" 0(35cm) diameter pot. Some extra humidity would be appreciated. A daily misting would be helpful. All text, photos,The Indoor Garden TV © 2015. Watermark theme. Powered by Blogger.